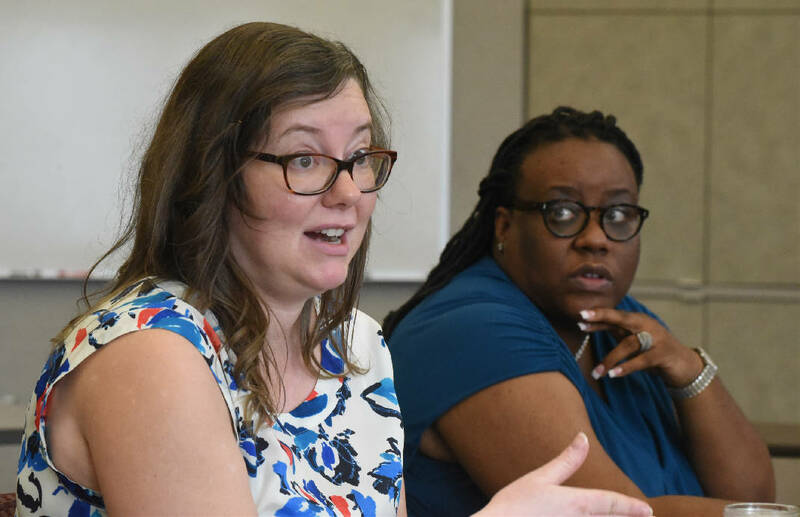 Executive director Elizabeth Crews and deputy director Lakweshia Ewing of UnifiEd speak about public education during a meeting held last August with the Chattanooga Times Free Press editorial board. Imagine: One central hub in your community that could provide health and social services, educational opportunities and community engagement. These hubs could offer everything from after-school programs to counseling, career planning services, cooking classes or anything else imaginable. UnifiEd's goal is to make that idea a reality through the Community School Model, which operates under the idea that schools need community involvement and vice versa to achieve success, explained UnifiEd Executive Director Elizabeth Crews. With assistance from the Great Schools Partnership nonprofit group in Knoxville, which operates 12 such community schools, UnifiEd is calling all members throughout the community to help determine what needs could be met and what services could be streamlined for accessibility in a local community school. "It's the idea that there is a public building, usually in the middle of the neighborhood that becomes a hub and a resource for the community,whether that's extended learning time for students, arts classes, a health center or whatever it is the community decides what it wants," said Crews. Although the concept is still in its beginning stages in Chattanooga, it is a model with great potential and minimal cost, she said, provided there is community interest and involvement. Initially, conversation focused on the East Ridge area for the first attempt, but the local initiative could grow and create such hubs throughout Chattanooga, said Crews. "This is a really exciting model happening not just in Knoxville but all over the country," she said. "This is just a really great, innovative approach." To learn more about the community school concept and success in other areas, visit greatschoolspartnership.com/community-schools. For more information on how to get involved locally, visit unifi-ed.org/take-action.